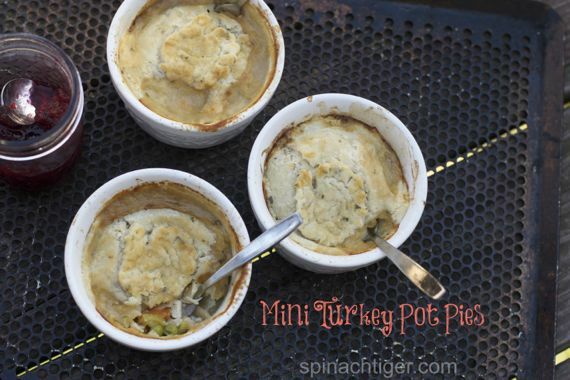 Using Thanksgiving turkey leftovers I made mini turkey pot pies, with a sage crust. Add butter or oil to small pan. Add onion, celery, carrots, and saute until all vegetables are softened. Add sage. Add turkey, gravy. Heat through. Cut pie crust into circles that fit your ramekins. Add in optional decorative pie crust additions if you choose to. You can always add in optional vegetables or more if you want to. Pour into ramekins. Top with pie crust. Brush with milk. Bake at 400 for twenty minutes or until crust is golden brown.